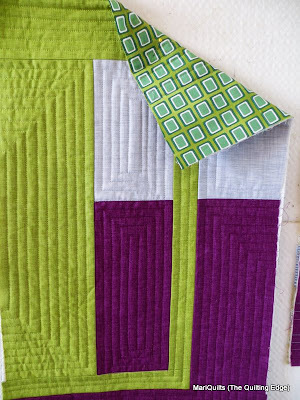 Since I have a lovely selection of variegated thread, my first thought was to go to that way, but as I quilted a small section, the doubts started creeping in. As much as I love this beautiful Valdani thread, I'm afraid it will compete with the simplicity of the overall design. I do like the calmer version on the right. Of course this meant an expensive trip to the store.....aren't they lovely. My first inclination was to buy some Aurifil thread, as it is really nice to work with, but alas not all the colours I needed were in stock (I tried two separate locations). 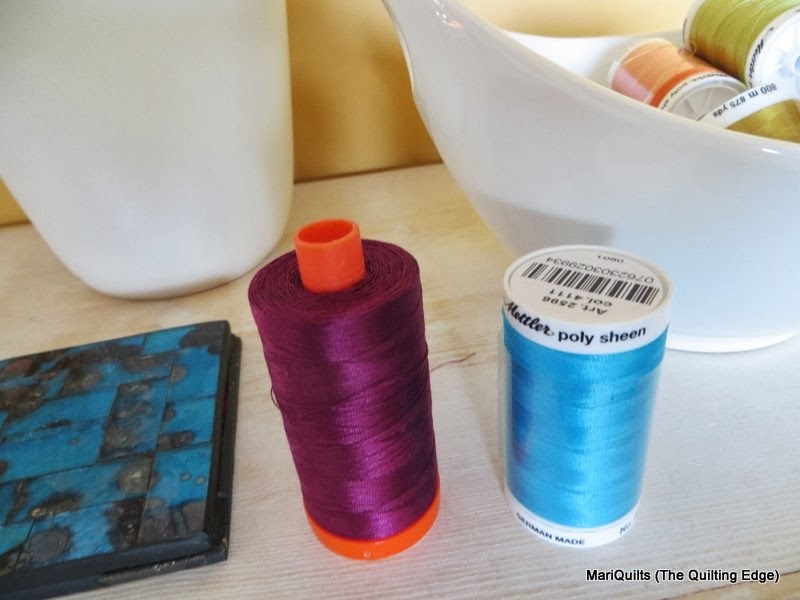 So I decided to give the Mettler poly sheen a try...gasp...I know, I know it's not cotton, but but but they had a huge selection of glorious colors and it really has a lovely sheen. So there you have it....I will be using both threads in the same quilt! I'm really living on the edge, aren't I!!!! And would you look at that lovely fabric on the back.....It was on the sale table, how could I resist? While on my outing, I ran into fellow Quilter/Blogger Nicole...at the car wash, of all places and she shared some wonderful news. VICTORIA....is starting a Modern Quilt Guild and if it could get any better, they will be meeting within walking distance of my place!!! One more thing....just how do I manage to create such a mess in such a short time, I've only been here a few days???? Some things never change. 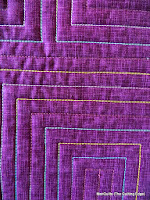 I like the simplicity of the matching thread, instead of the variegated one too. Good choice. And I couldn't help but notice the little white table your machine is on. Could you tell me what it is / who makes it? Thanks! Thanks, as soon as I get some info...I'll pass it along. I believe the first meeting will be later in September at the Satin Moon Quilt Shop on Fort Street. Just the news I have been waiting for! 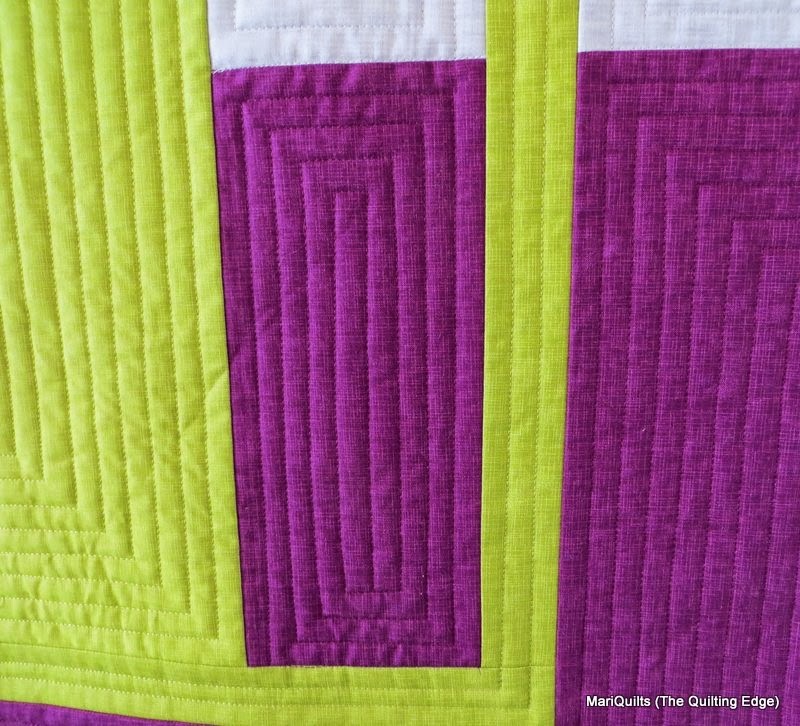 I am also interested in joining a modern quilt guild in Victoria. Would you mind passing on info to me as well? I really appreciate it. 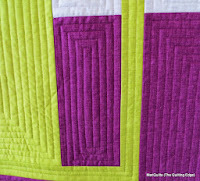 Your quilt is looking great and I am sure two kinds of thread will work just fine. Maybe you can join two modern guilds, does that make you double modern? 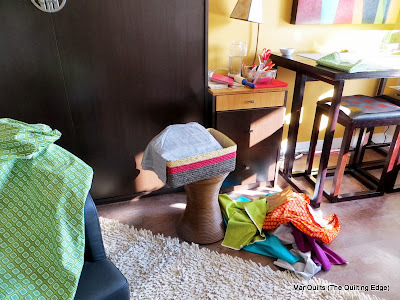 At least something beautiful has come out of your sewing room mess...! 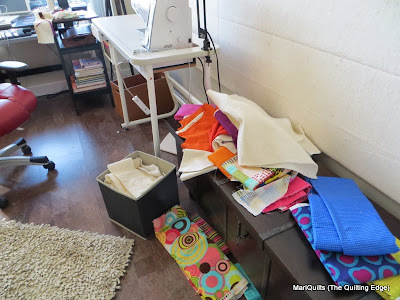 It’s not such a big mess, you should take a peek here! 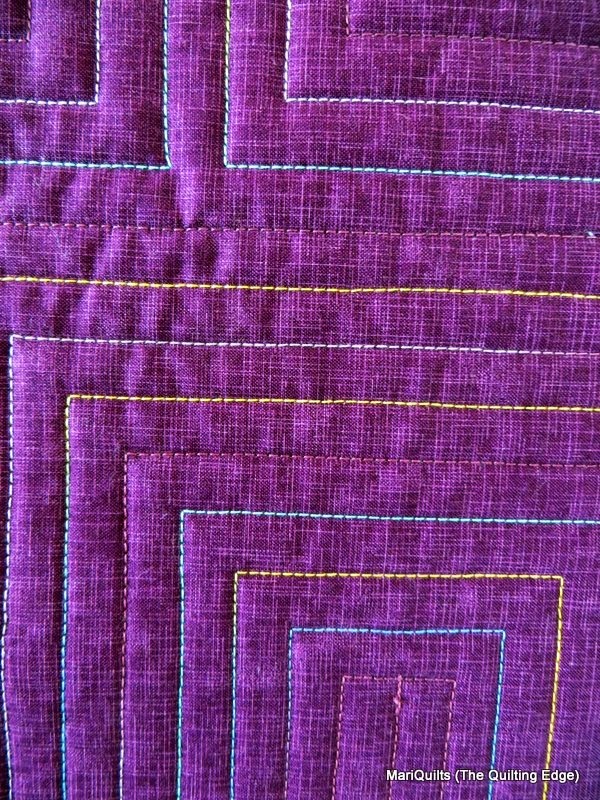 Love your quilting, I always do, such nice straight lines and corners! you're quite right, the variegated is gorgeous but the calmer version on the right suits what you're doing more. Thanks....and yes it's creativity not a mess, I like that. 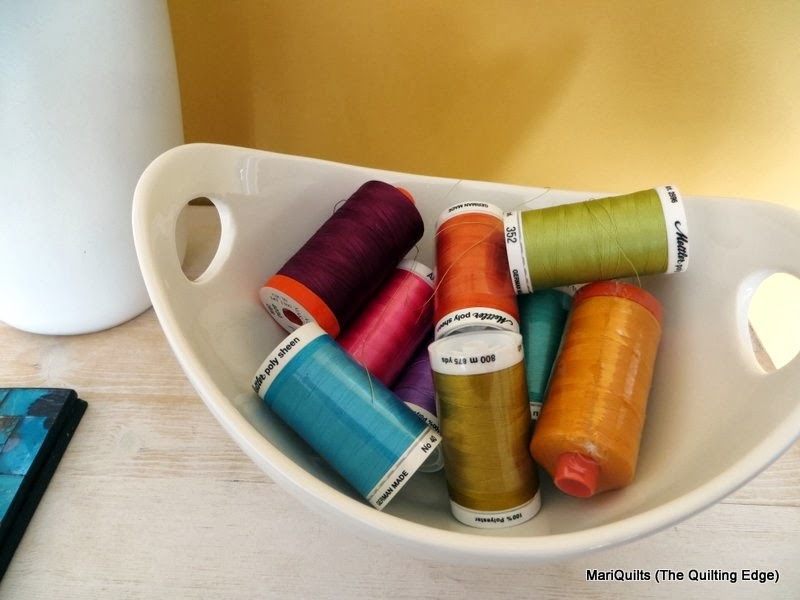 i liked your comment about living on the edge by using two kinds of thread. You might say you're living on the Quilting Edge, eh? LOL! I really need to get a life, don't I!!! I have a hard time committing to variegated thread too! What ever kind of thead you use...your pieces will always be beautiful! 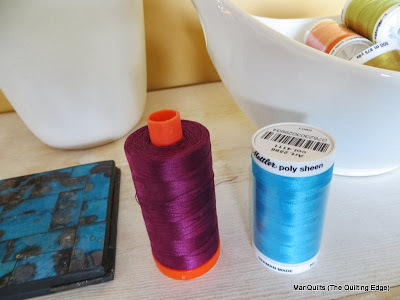 I have been having an internal debate this morning on the subject of varigated versus solid colored thread for quilting a mini, so your blog today was very timely! I think you're right, the solid color complements the quilt better. And that's going to be my choice too! I buy variegated thread all the time but like yarn it often looks better on the spool than sewn (or knit). Your solid poly looks fantastic! The easiest way would be to google Murphy Beds Or Wall beds....that should help you locate something near where you live.